Bring Some Flash and Pizzazz to your next Party or Gathering.. These Rockstar Shutter Shade Sunglasses are HOT! Lets you rule the RAVE! Give a light show or just Dance in style. 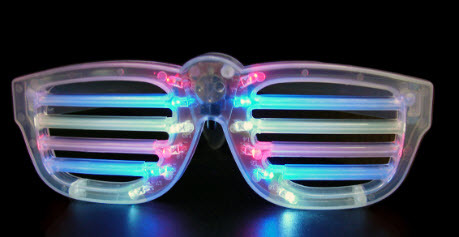 LED flashing sunglasses with shutter shades. They are all what's hot this year! New multicolored shutter shades feature clear frames which allow the light to reach from the nose to the edges of the lense. Multiple flashing modes and multiple colors means that you will stand out like a Rock Star when you put them on. This brand new product puts a 21st Century Spin on retro shutter glasses. Unlike other glasses of this style, we added our lights on the inside to light up the frame and shutters. Push the button between the lenses to change the flashing mode or push the button 3 times to make the lights stay on with no flash. The look on these glasses is unique. Please note this product will not fit most children under the age of 7. Product is for novelty purposes and should not be warn when optimum visual conditions are required such as driving. Product contains 2 CR927 batteries, included, non-replaceable. and Be the Coolest Person Around. Disclaimer: This product is not suitable for children under 5yrs of age. LED Gloves & Rockstar LED Sunglasses "In Action"
Here some more LED Rockstar Flashing Sunglass Fun! in Action - Fast Forward to about 2:50 into this Video!